Redesigned by renowned architect Philip Watermeyer, this five-bedroom English manor in Westcliff is beautifully set on 3965 m² of exquisite landscaped gardens that include a pool, tennis pavilion and court. The home itself boasts a central atrium, wine cellar as well as five garages. With its Italian Carrara marble, terracotta tiles and custom-designed Wilton carpets, the main en-suite bathroom is luxury personified and sure to satiate any lover of the finer things in life. This stately home, nestled in the beautiful suburb of Bishopscourt, boasts five-bedrooms with four en-suite, an extensive open-plan entertainment area, study and stunning landscaped gardens with a separate pool area. 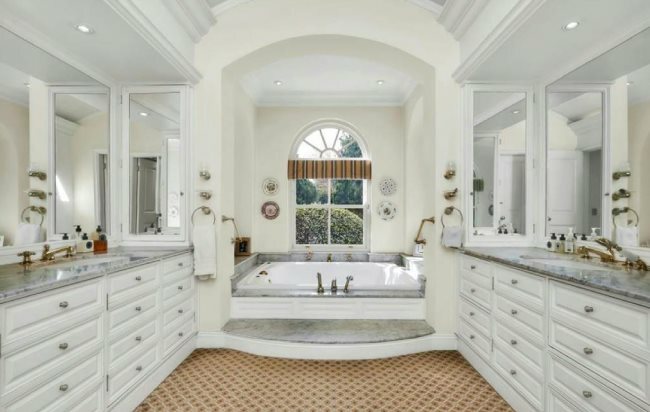 The master bathroom lives up to the grandiose feel of the home with its opulent marble finishes and eye-catching chandelier. 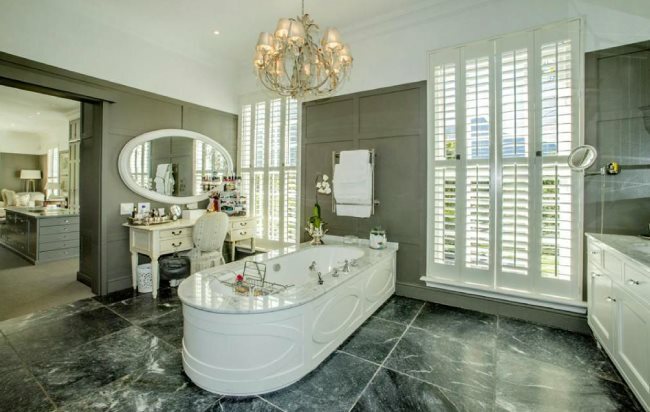 The bathroom also includes a to-the-side make-up vanity area for that extra touch of luxury. Despite its two-bedroom offering, this bungalow doesn’t hold back when it comes to living the lavish life. The open plan design provides the perfect spot to take in the beauty of Clifton’s Fourth Beach which, given the property’s position, is right at your doorstep. The Garapa decking also includes an in-situ pool for cooling off in the privacy of your own home. 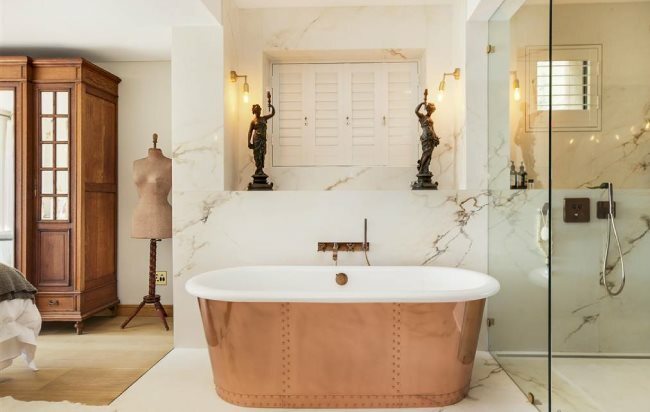 The pièce de résistance however can be found in the main bathroom which boasts a beautiful marble finish accompanied by a show-stopping copper bathtub. Step into this state-of-the-art family home also overlooking Clifton’s magnificent Fourth Beach. With two dining rooms, two lounges, a bar and snooker room, these homeowners have spared no expense when it comes to living in lavish comfort. If that wasn’t enough, this four-bedroom home also boasts a built-in aquarium, jacuzzi, sauna and cinema. 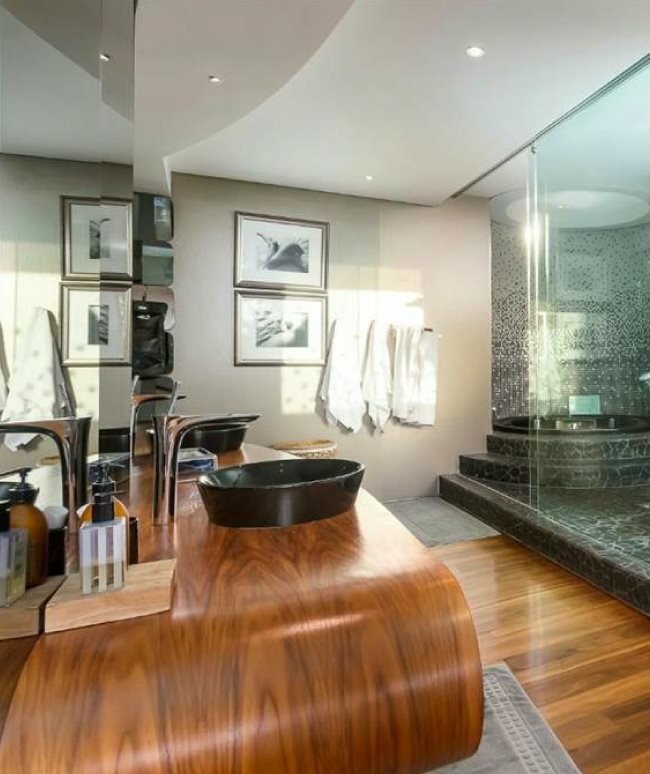 The master en-suite is no exception with its wooden panelled flooring and bespoke wooden vanity and sink. Situated on a double-stand property on the beachfront in La Lucia, this home offers not only an unbeatable sea view, but a sprawling two-winged design. The main wing comprises of three bedrooms that each come with a walk-in dressing room, two studies and granite kitchen while the second wing has four en-suite bedrooms, with the lounge and entertainment area in the other wing. 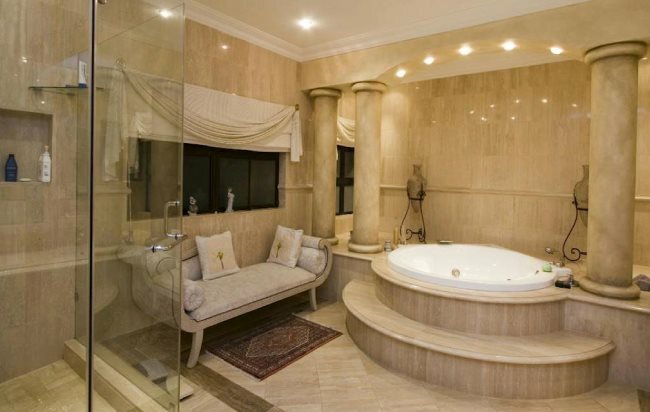 The main bathroom continues the larger-than-life feel with marble pillars and indulgent inset bathtub. This five-bedroom home in Simbithi Eco Estate has been uniquely designed to bring comfort to the next level. It features a world-class home cinema, high-tech kitchen with a walk-in fridge/freezer as well as a heated pool and wine cellar that looks directly into the depths of the pool. 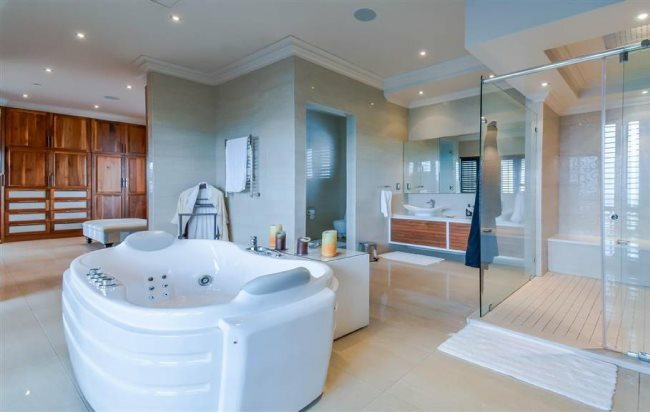 The sprawling master en-suite brings a sense of opulent comfort with its state-of-the-art bathtub, separate toilet and walk-in rain shower.